Ensemble Real Estate Investments and AECOM Capital today broke ground for a 250-room luxury lifestyle hotel, the first in decades to be built in Silicon Valley from the ground up. 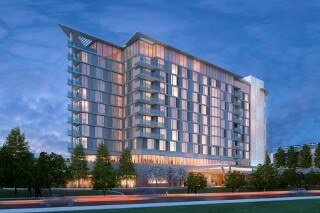 The 11-story hotel, which will be a member of Marriott’s Autograph Collection®, is a key component of Silicon Valley’s landmark Menlo Gateway project, which will transform 16 acres of industrial land east of Highway 101 in Menlo Park into a vibrant work and leisure environment. Menlo Gateway will be developed by the Bohannon Development Company. In addition to the hotel, it will include three office buildings and accompanying parking structures, a Bay Club fitness facility, and outdoor amenities. Inspired by the culture of innovation in Silicon Valley, the property will be a full-service, four-star hotel featuring an iconic architectural design built to the LEED Silver-level of certification for sustainability. With architectural design elements that pay homage to the curved bow of an elegant sailing ship, the hotel’s rich character and details reflect the personality of Menlo Park while meeting the needs of today’s independent, high-tech business travelers. Minneapolis-based Cuningham Group Architecture has been selected as the project architects. Cuningham Group has designed numerous landmark hospitality and resort properties in the U.S. and Asia. McCartan Interior Design, based in New York, is providing interior design services. The hotel is expected to open for business in late 2017.